The Ryu II is very similar to the original Ryu with its laser guns, but also has a machine-gun for close infantry defense. The Ryu III, mounts two impressive rail guns, from Japanese design. This reference allows you to field one of these two variants. The Ryu was the first walker developed specifically for the Imperial Japanese Armed Forces, with great help from the Central Axis powers, especially Germany. 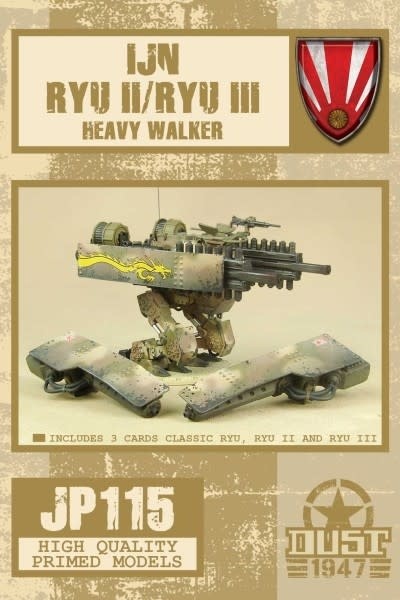 Assembled on the powerful chassis of the PanzerKampfLäufer III, it has become the most common walker in the Japanese arsenal. The second version is very similar to the original Ryu with its laser guns, but also has a machine-gun for close infantry defense. The third version, Ryu III, mounts two impressive rail guns, from Japanese design. This reference allows you to field one of these two variants. 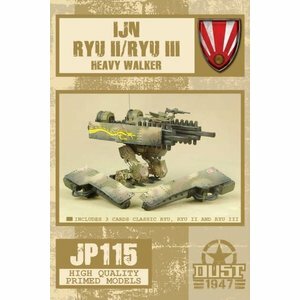 This reference comes with two Dust 1947 unit cards, one for each variant, both for the IJN Bloc. Like all regular Dust 1947 miniatures, it comes already assembled and primed. It's ready for the battlefield, or for painting, as you wish! You can directly paint over on it, since the priming serves as an undercoat and is compatible with any type of paint.